Nothing is more boring that a Lunar Eclipse. You spend hours staring at a somewhat normal moon, your legs get tired, and whatever previous excitement you may have had quickly dwindles leaving you with nothing but strained eyes. Yet…a Lunar Eclipse is still pretty sweet. The sheer fact that it is rare makes it awesome. So, its February 20th, the night of the eclipse. At around 6:30 pm (pst) I jump out of my chair and alert everyone within shouting distance that its time to go watch the eclipse. No response. In a second attempt to gain some followers I explain that its the last complete Lunar Eclipse until 2010 and finally, among grumbles and sighs, but still some inevitable curiosity – I successfully lead everyone outside…Only to find that its cloudy. 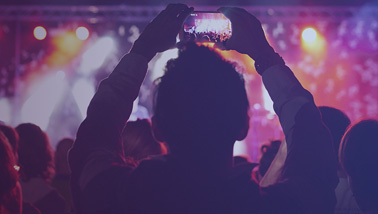 In defeat I sat back down to my computer, blindly browsing my internet haunts. Huge success! 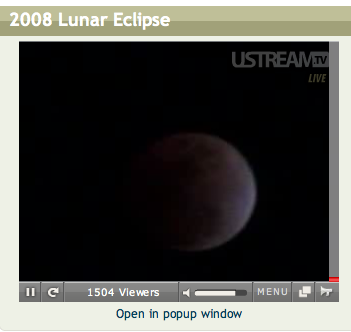 Low and behold, someone on Ustream, in non-cloudy-Florida, was streaming the Lunar Eclipse. As I sat watching the moon slowly go dark, I enjoyed a lively chat with other viewers from all over the world. We were happy as could be. I was completely glued to my seat for over an hour watching something that I found extremely boring. I’m not sure if it was the fact that I needed to see the moon go completely dark before I’d be satisfied, or if it was the crazy conversations I was involved in with the other viewers. Random people shouting “GOOD NIGHT MOOOON!”, “MOON! SHOE ON HEAD”, and the occasional babbling of a learned astronomer created such an entertaining and friendly environment that I couldn’t leave. Although I wasn’t the one streaming, I felt involved. I think its safe to say that, along with the thousands of other viewers who watched the Lunar Eclipse on Ustream, this random Ustreamer made my night.